Home / How to Set Up ELEX Dynamic Pricing and Discounts Plugin for WooCommerce? This article intends to provide detailed, step-by-step instructions that’ll help you setup Dynamic Pricing and Discounts Plugin for WooCommerce plugin. Refer the product page to know more about other various features of the plugin. 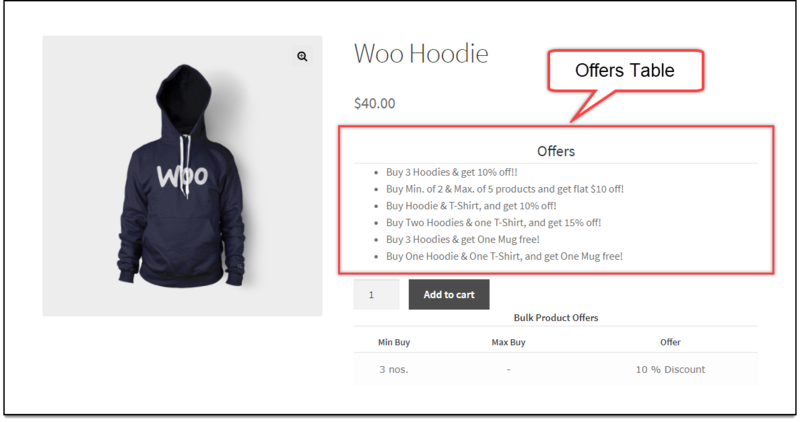 Dynamic Pricing and Discounts Plugin for WooCommerce facilitates in providing discounts on products, categories, cart, a combination of products or categories, and buy-and-get-free offers (BOGO) for products as well as categories. With this plugin, you can offer a percentage discount, flat discount, or fixed price discounts for products. You can also select user role(s) and apply discounts for a specified date range. For multiple offers for a single product, our plugin provides Offers Table option, which can be displayed on the product page for the convenience of customers. You can show discounted price on product page and shop page as well. You can also set maximum discount amount, offer a discount to only specific customers using their email IDs, set a minimum number of orders, and a lot more features for your convenience. This plugin is the most functional solution for achieving WooCommerce dynamic pricing and WooCommerce discounts on your online store. Buy minimum three units of a product (P1) and get 15% discount (maximum discount allowed = $12). Buy between five to 10 units of a product (P2), and get a flat discount of $10. Buy at least 6 pounds of a product (P3) and get a special reduced price of $25. Buy a product (P4) at a price range between $20 and $30, and get 20% discount. Get a product (P5) at 30% discount only for our Gold Members (specific role). Get 20% discount on a product (P6) valid from dd/mm/yyyy to dd/mm/yyyy. Buy between two to three items from electronics category, and get 20% discount (max discount allowed = $50). Buy more than two items from home decor category and get a flat discount of $10. 12% discount on mobile category for our wholesalers (specific role) valid from dd/mm/yyyy to dd/mm/yyyy. Buy two units of one product (P1) and three units of another product (P2), and get 20% discount (maximum discount allowed = $20). Buy one unit of (P3) and one unit of product (P4) and get flat $15 discount. Buy two units of P5 and two units of P6 at a special price of $29; valid only for Gold Members (specific roles). Buy three units of P7 and one unit of P3 at a special price of $10.99; offer valid from dd/mm/yyyy to dd/mm/yyyy. Buy one unit of category (C3) and one unit of category (C4) and get flat $15 discount. Buy two units of category (C5) and two units of category (C6) at a special price of $29; valid only for Gold Members (specific roles). Buy three units of category (C7) and one unit of category (C8) at a special price of $10.99; offer valid from dd/mm/yyyy to dd/mm/yyyy. If your cart contains two to three products, get 20% discount on the cart (max discount allowed = $50). If you have added at least 2 items in the cart, get a flat discount of $10 on total cart value. If the weight of total items in the cart is more than 15 pounds, get 30% discount on the cart. 5% discount on all items in the cart for our wholesalers (specific role); valid from dd/mm/yyyy to dd/mm/yyyy. Buy one and get one free (BOGO rules). Buy two distinct products and get another product free. Buy products from two distinct product categories and get a product free. And there are lots of other features that are bundled together to serve WooCommerce dynamic pricing and WooCommerce discounts needs for your online store. Dashboard > Plugins > Installed Plugins > Dynamic Pricing and Discounts for WooCommerce > Settings. The plugin settings are divided into four tabs – Discounts Rules, Settings, Licence and Import/Export. Read on to know what each tab offers. 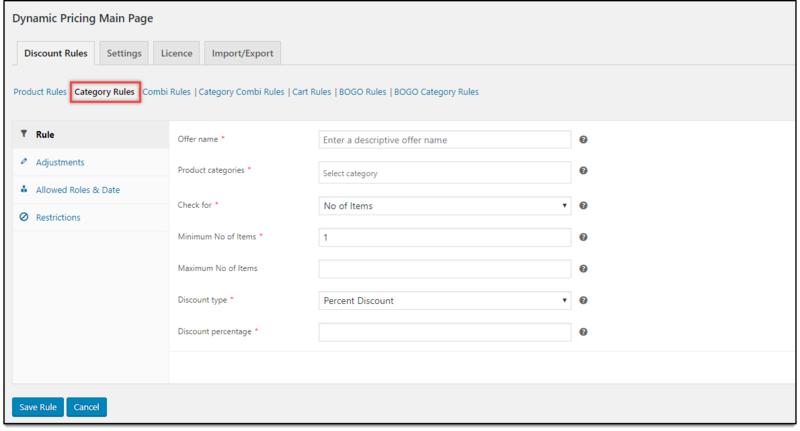 In this section, you can configure all discounts rules like product rules, category rules, combinational rules and so on. Let’s understand each discount rule in detail. In this type of rule, the discount is applied at the product level. Click on Add New Rule to get started. The settings are divided into four sections, as shown in the screenshot below. Offer Name: Enter a suitable name for the offer. 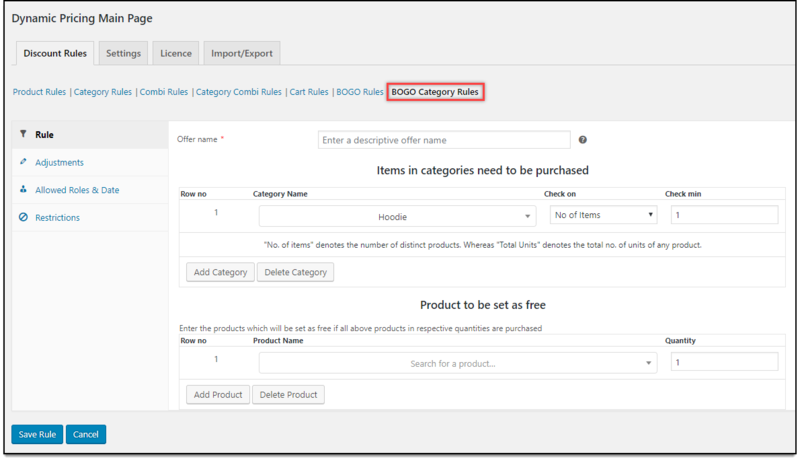 Rule applicable on: You can apply a rule either to selected product(s), all products in a specific category or all products in the cart. Products: For individual product(s) option in the previous setting, this setting will list products to be selected. A single rule can be applied to multiple products just by selecting required products in this field. For specifying category option, it will list product categories. Check for: You can apply the discount based on either quantity, weight or price of the product. Minimum & Maximum: Enter the respective minimum and maximum value for the attribute selected in the previous setting. Discount Type: Select the type of discount to be applied, and enter the discounted value in the given text field. Percent Discount: Provides percentage based discount on product amount. Flat Discount: Provides flat amount discount. Fixed Price: Provides fixed discounted price for the product(s). Maximum discount amount: Enter an integer amount to set up limit for the discount. Adjustment amount: You can set an amount that will be adjusted with the total discount price. Allow repeat execution: By default, every rule is executed only once. If you want to execute the rule more than one time, you can tick this checkbox. 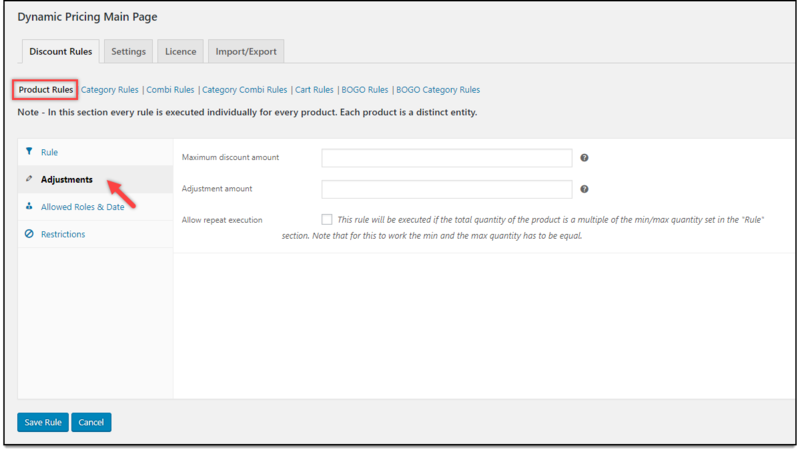 This rule will be executed if the total quantity of the product is a multiple of minimum/maximum quantity specified in the Rule section. But remember, for this option, the minimum and maximum quantity has to be equal. Allowed Roles: You can apply a rule for all user roles or select a specific role as per your requirement. Valid from date & Expiry date: Specify the date range within which the respective product rule should be valid. Allowed Email IDs: If you wish to restrict the discount rule to specific users, you can enter their email IDs in this text field. Minimum number of orders (previous orders): Enter a minimum order quantity for the discount to be applied. Minimum total spending (previous orders): Enter minimum total spending required for the discount to be applied. This means the rule will only be executed when this limit is reached. Click Save Rule to add a new rule. A sample product rule is as shown in the below screenshot. Click edit icon/pencil icon in the desired rule to modify or update the rule. For example, let us increase the Maximum Quantity from 3 to 5. Update required field and click Update Rule, as shown in the below screenshot. Click Bin icon to delete a discount rule. You can only delete one rule at a time. Offer: Buy a minimum three units of Hoodie, and get 10% discount. The product rule can be configured as shown in the screenshot below. The product will be affected on the cart page as shown in the below screenshot. Description: Total amount for Hoodie is $140 ($40×3). When discount of 10% is applied, the total chargeable amount is $108 ($120-$12). As the name suggests, discount rules are applied to product categories. The settings are similar to product rules, except that you have to select product categories, instead of products. Configure category rules using following fields. Product categories: Select your desired category(ies) for which you want to apply the rule from the selection list. Check for: You can apply the discount based on either total number of distinct items, weight, price or total units of the product. Discount Type: Select the type of discount to be applied, and enter the discounted value in the next text field. Adjustment amount: Enter an amount that will be adjusted with the total discount price. Allowed Roles: You can apply a rule for all user roles or select a specific role as per your need. Valid from date & Expiry date: Specify the date range within which the respective category rule should be valid. Minimum total spending (previous orders): Enter minimum total spending required, for the discount to be applied. This means the rule will only be executed when this limit is reached. Click on Save Rule button to add a new rule. Offer: If a customer purchases a minimum of two and maximum of five products from category Clothing, a flat discount of $10 is offered. 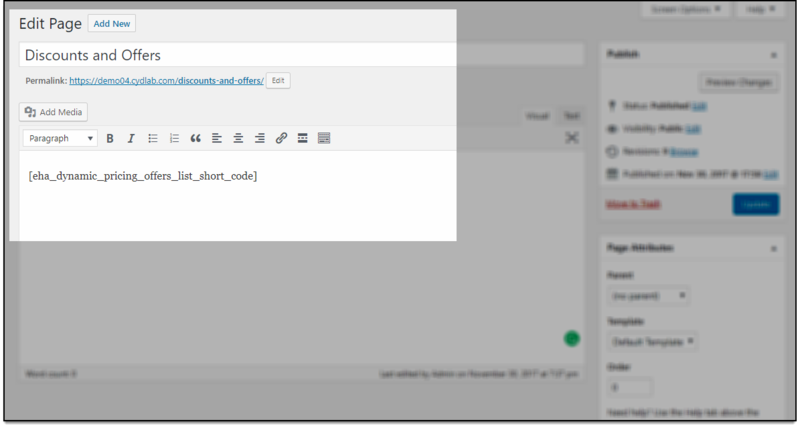 For the above offer, category rule can be configured as shown in the screenshot below. Following screenshot shows how the cart page will be affected. Description: Total amount for Hoodie ($40×2) and T-Shirt ($20×2)is $120. When discount of $10 is applied, the total chargeable amount is $110 ($120-$10). Combinational rules are applied to a combination of two or more products. Configure combinational rules using following fields. Offer Name: Enter a suitable offer name. Product Name: Select product from the drop-down list for which you want to apply the rule. Click on Add Product button to add the product to be offered in combination. Quantity: Specify the quantity of the respective product. Valid from date & Expiry date: Specify the date range within which the respective combinational rule should be valid. Apply discounts only on these products: You can choose to apply the discount on selected products in combination. To do this, select product(s) from the product combination. If you leave this field blank, by default the discount rule is applied to all products in the combination. Click Save Rule to add a new combinational rule. Offer: If a customer purchases one unit of Hoodie and T-Shirt each, a discount of 10% is offered. The combinational rule for the above offer can be configured as shown in the screenshot below. Description: Total amount for Hoodie ($40) and T-Shirt ($20) is $60. Discount 10% of $60 is equal to $6. Hence the total chargeable amount is $54 ($60-$6). This rule is pretty similar to Combinational Rules for products. 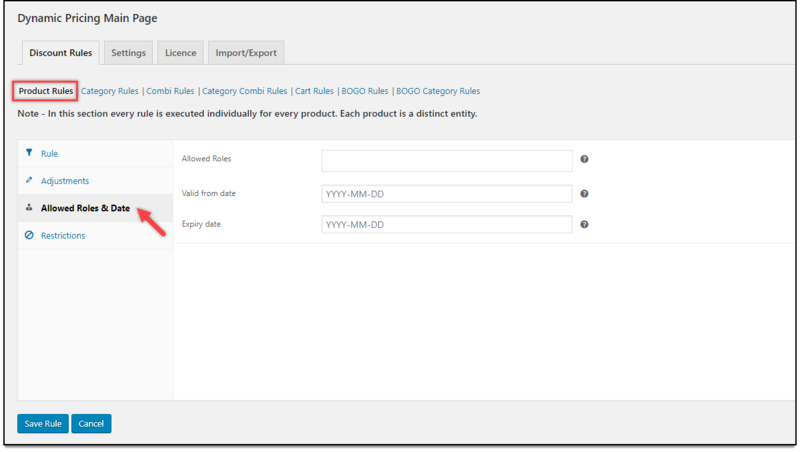 Instead of products, you can create rules by combining categories. Configure following fields for category combinational rules. Offer Name: Specify a suitable offer name. Category Name: Select the desired category from the drop-down list for which you want to apply the rule. Click on Add Category button to add the product category to be offered in combination. Quantity: Specify the quantity of the product(s) of the respective category. Valid from date & Expiry date: Specify the date range within which the respective category combinational rule should be valid. Click Save Rule to add the rule. Offer: If a customer purchases two units of Hoodie and one unit of T-Shirt, a discount of 15% is offered. Category Combinational rule for the above offer can be configured as shown in the screenshot below. Description: Total amount for Hoodie ($40×2) and T-Shirt ($20×1) is $100. Discount 15% of $100 is equal to $15. Hence, the total chargeable amount is $85 ($110-$15). Configure following fields for cart rules. Valid from date & Expiry date: Specify the date range within which the respective cart rule should be valid. Minimum & Maximum Stock Limit: Enter the minimum and maximum stock quantity of the products. With this feature, you can offer the discount on products of certain stock range only. 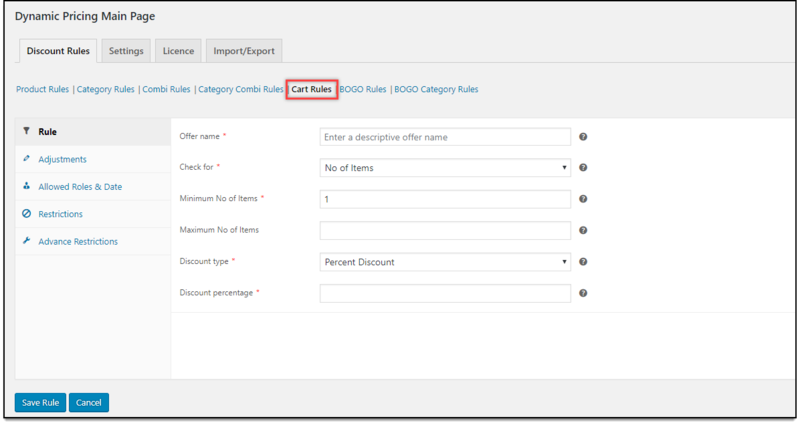 Based on Product Attribute: This setting allows you to restrict cart rule to specific product attribute(s) and the attribute value(s). Click on Add New Attribute button to configure product attributes as shown in the screenshot below. 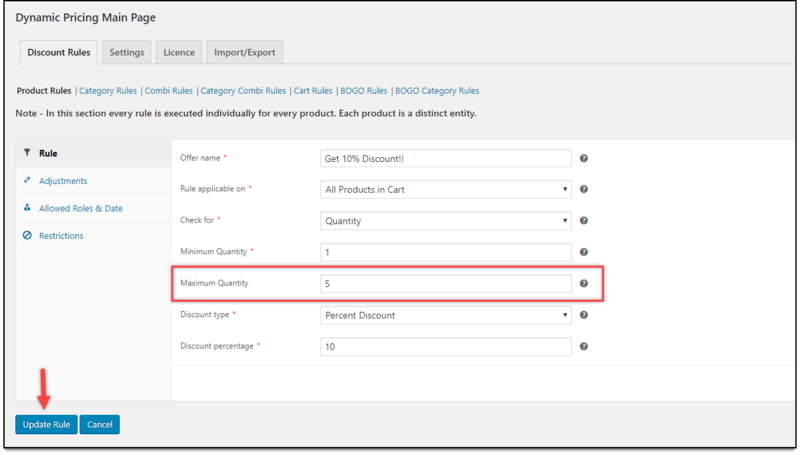 You can choose to apply the cart rule when the products in the cart can match any one of the attributes, or should match all the listed attributes. Allowed Payment Methods: Select payment method(s) from the selection list, for which you choose to apply the cart rule. This setting will list all the manual as well as premium payment extensions. Allowed Shipping Methods: Just like payment methods, you can restrict cart rule to desired shipping methods. This setting will list all enabled default shipping methods as well as premium shipping methods. Click Save Rule to add a new cart rule. Offer: If a customer purchases any three T-Shirts, a discount of 10% is offered only on green T-Shirts. 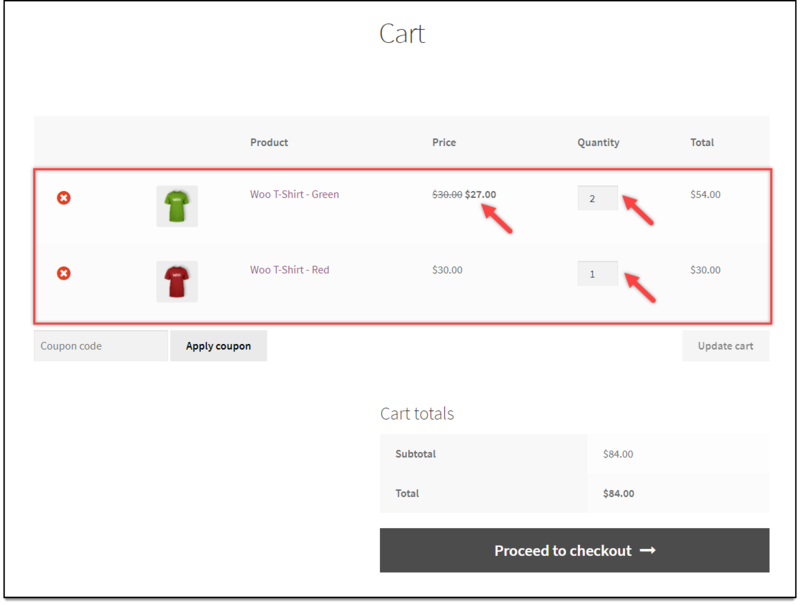 Description: When the cart contains three T-Shirts, including variation green, a 10% discount is applied. Therefore, the green t-shirts will cost $54 ($60-$6). Configure buy-and-get-free rules using following fields. Purchased Products Table: Select product(s) that customers need to purchase to be eligible for free product(s). 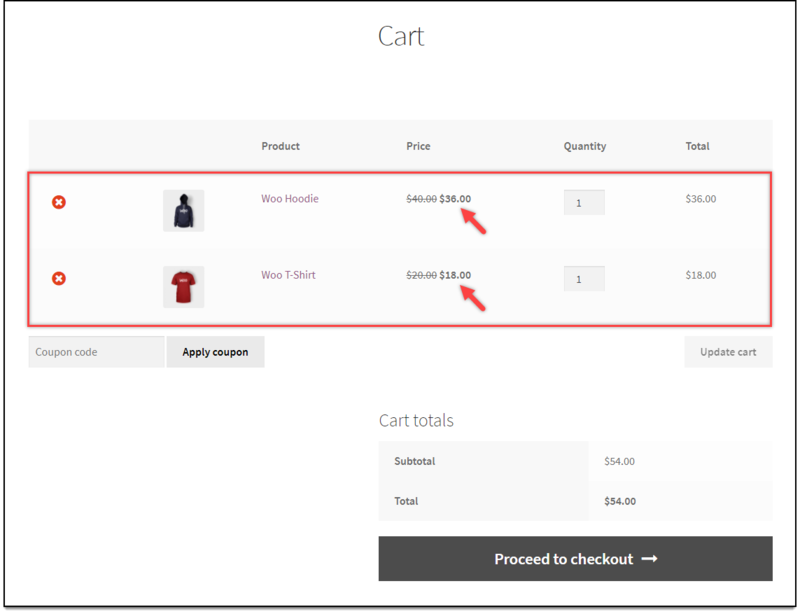 You can add multiple products to a rule by clicking on Add Product button. 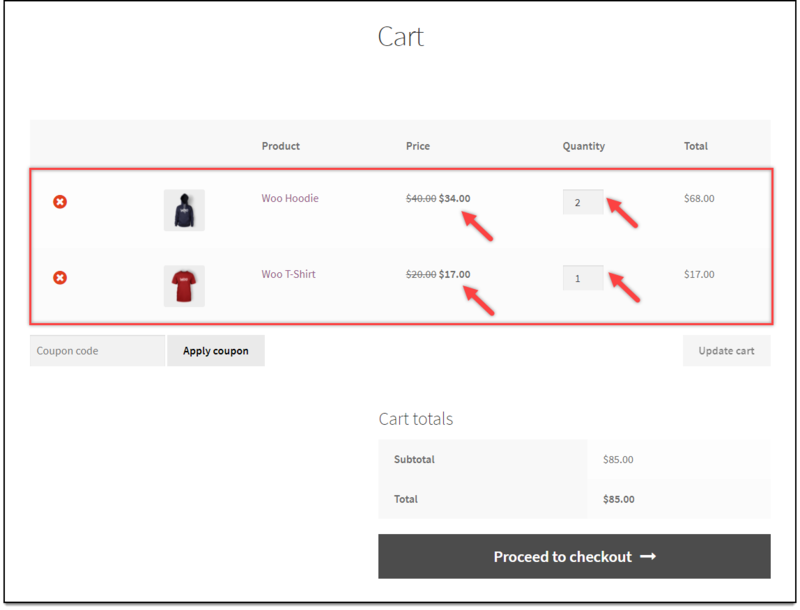 Use Quantity spin box to specify the units of products that have to be added to cart to get free product(s). Free Products Table: Select product(s) that you will offer for free with the purchased products selected in the previous table. Similar to purchased products table, you can add multiple products to a rule by clicking on Add Rule button. Use Quantity spin box to specify the units of products that will be offered for free with the purchased products. Allow repeat execution: By default, every rule is executed only once. If you want to execute the rule more than one time, you can tick this checkbox. Valid from date & Expiry date: Specify the date range within which the respective BOGO rule should be valid. Click Save Rule once all settings are configured. Offer: If customers purchase three units of Hoodie, they get one mug absolutely free. 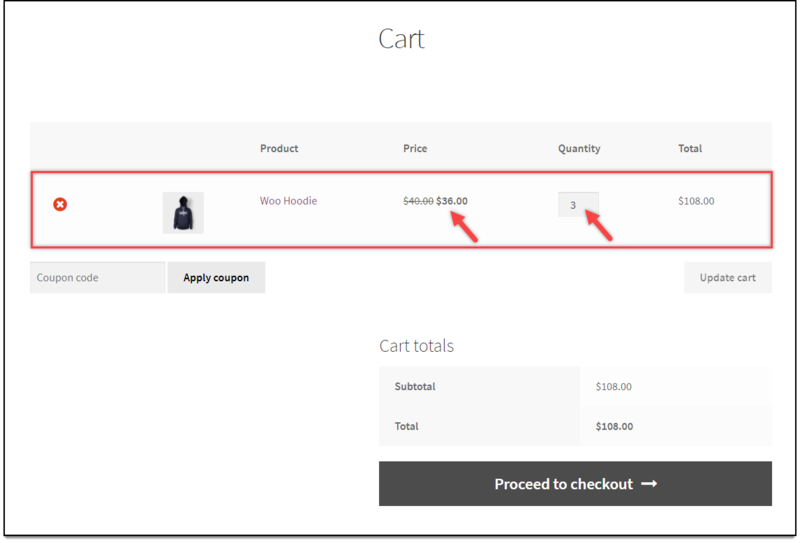 Description: Free mug is added to the cart only when Hoodie reaches the required quantity, i.e three. 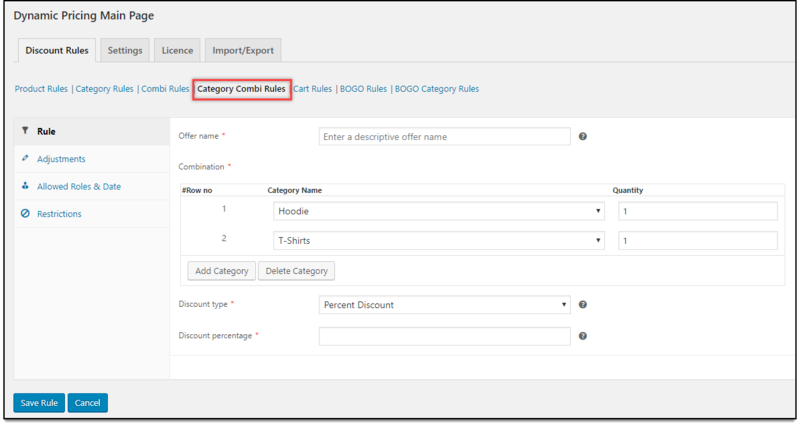 Configure buy-and-get-free category rules using following fields. Purchased Products Table: Select product category(ies) from which customers need to purchase items, to be eligible for free product(s). 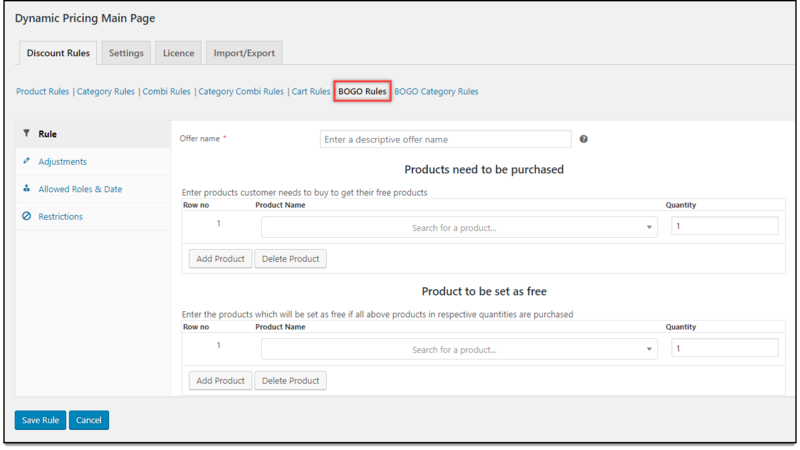 You can add multiple product categories to a rule by clicking on Add Category button. You can check the rule for the total number of distinct items or total units of a product. 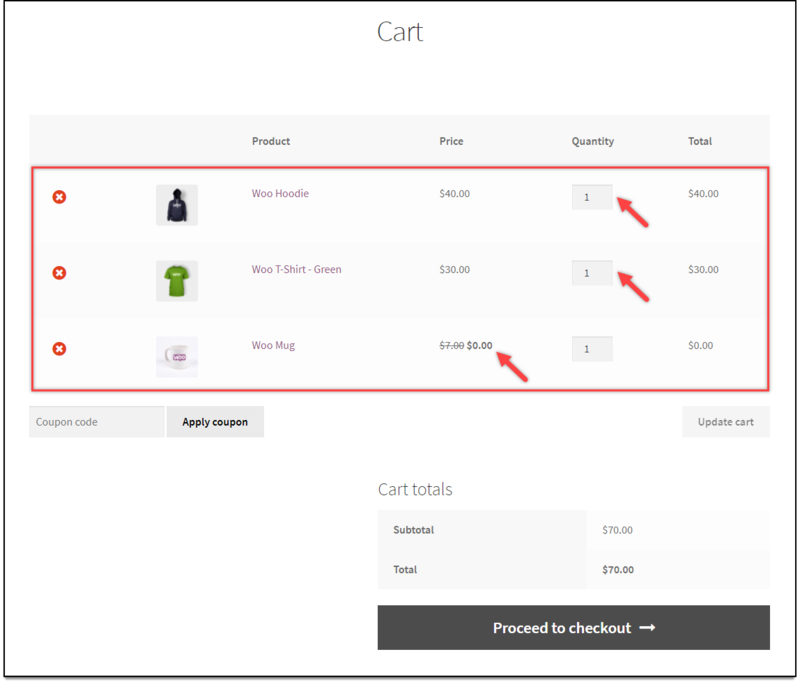 Use Quantity spin box to specify the units of products that have to be added to cart to get free product(s). And use Quantity spin box to specify the units of products that will be offered for free with the purchased products. Valid from date & Expiry date: Specify the date range within which the respective BOGO category rule should be valid. Offer: If customers purchase one unit of Hoodie and T-Shirt respectively, they get one mug absolutely free. 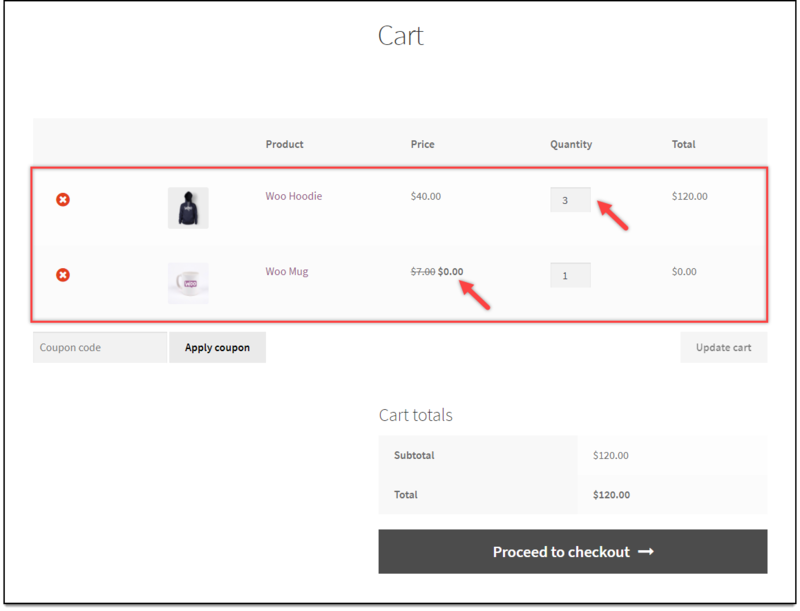 Tip: If you wish to add free products automatically to the cart, enable the Automatically add free products option of BOGO options under the Settings tab. Else, customers need to add free items manually (this setting is discussed in the next section). This tab contains generic settings which will be applied to all discount rules. 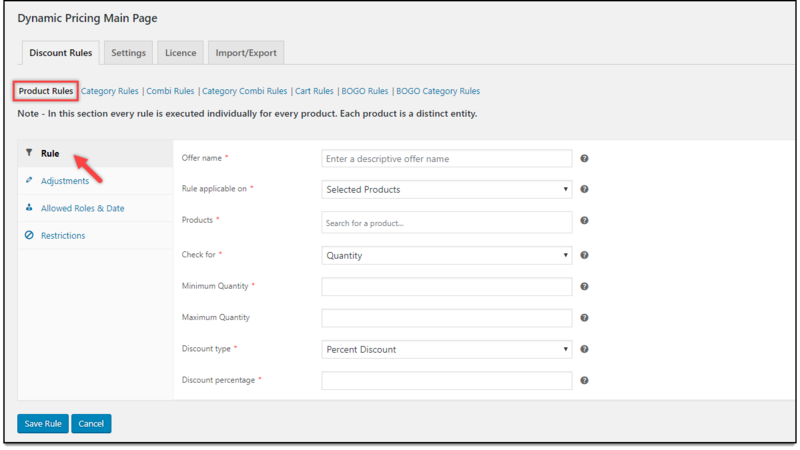 In this section, you can enable or disable desired discount rule(s). 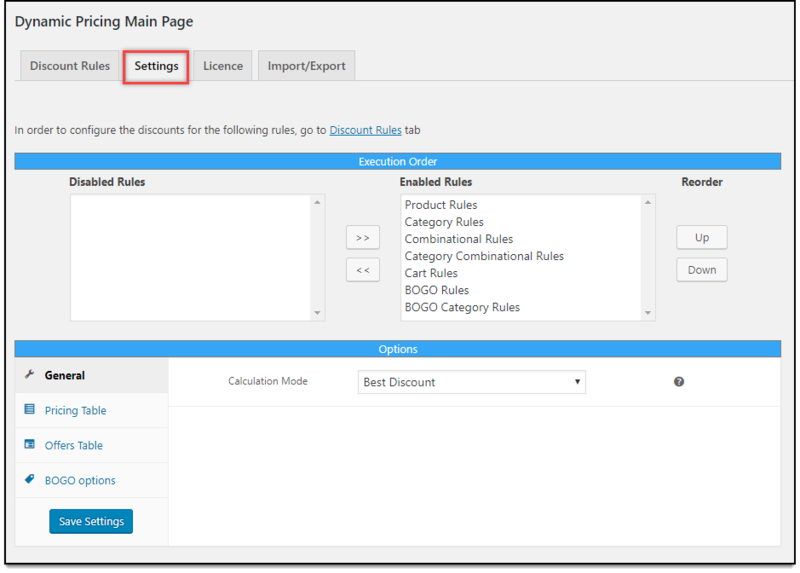 To disable a discount rule, select the respective rule, and click the left shift button. 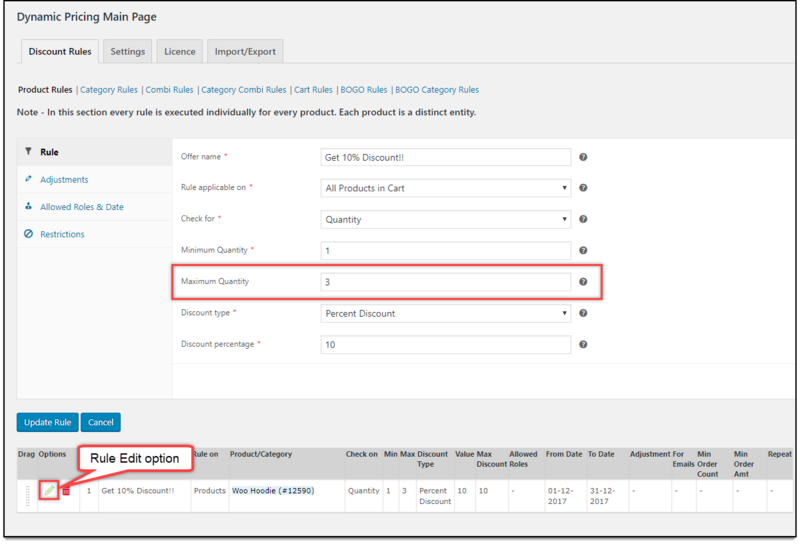 To enable it, select the desired discount rule, and click on right shift button, as shown in below screenshot. You can change the order of discount rule by selecting the desired discount rule and moving its position in the Reorder option. This order will determine how the rules or discounts will be applied to the products. General: In this setting, you can select how the discounts will be calculated. Best Discount – Checks for the best discount among all the discount rules, and applies. First Match Rule – Applies the first discount rule encountered for the product. All Matched Rule – Applies all the discounts for every product that comes with the discount rules. Pricing Table: In this setting, you can configure how the available pricing discounts will be displayed for a particular product on its product page. Remember, the pricing table will only show offers from Product Rules. You can choose to enable or disable this option, and specify where the pricing table is to be placed. You can also set a custom short name for product quantity in the pricing table. Below is a screenshot showing how pricing table will be displayed on product page. 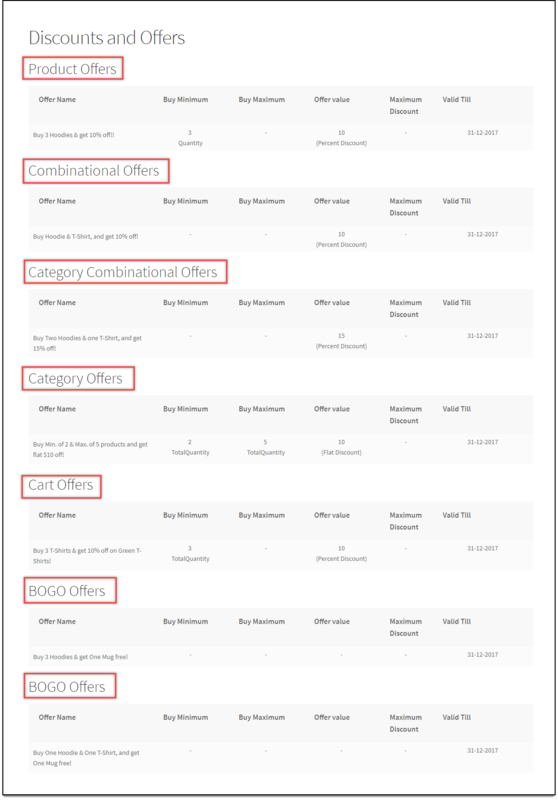 Offers Table: Allows you to display all the available discount offers available for the product on its product page. You can choose to enable or disable this table, and specify the position on the product page. Here’s how the offers table will be shown on the product page. BOGO Options: For Buy One Get One offer, you can choose to add the free product automatically to the cart. 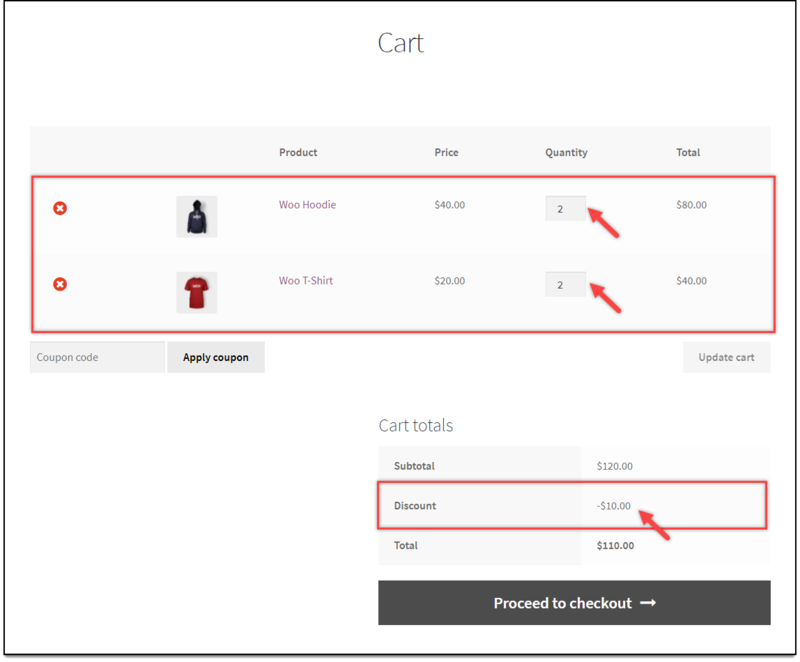 If you have disabled this option, customers have to add the free product to the cart, manually. Once all these settings are configured, save the settings. 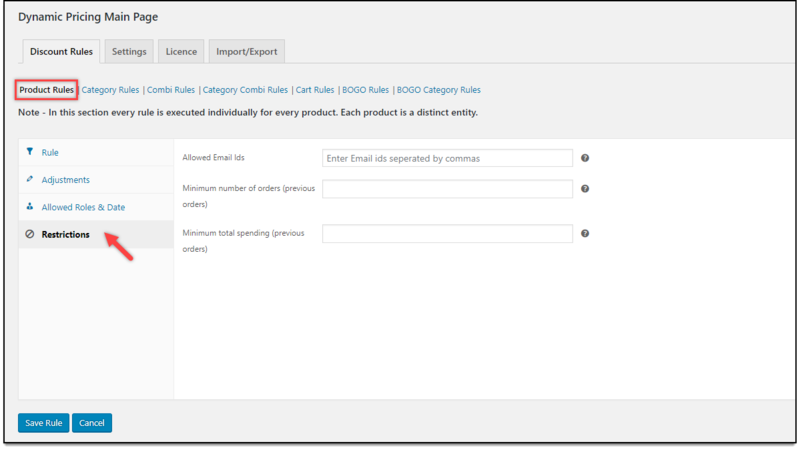 To start importing or exporting various rules, go to Dashboard > WooCommerce > Dynamic Pricing > Import/Export tab. You can export all types of rules one at a time. 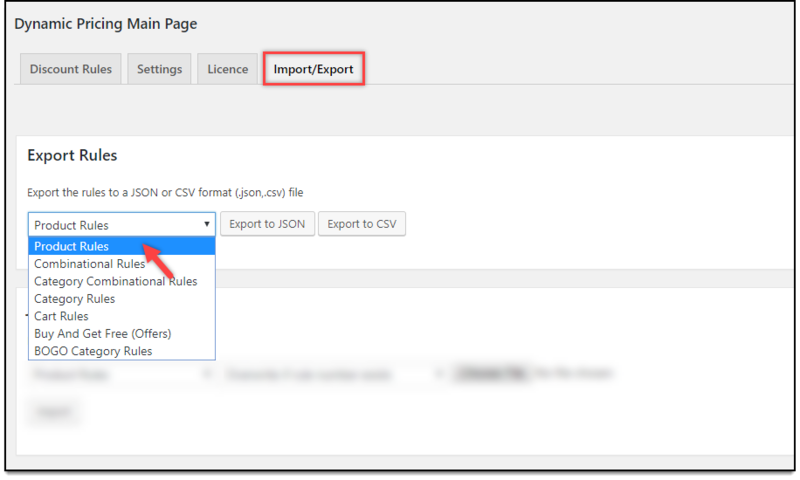 Select a rule type to be exported and click on desired export format button, that is, JSON or CSV. The rules will be exported to the selected file format. The settings are shown in the screenshot below. 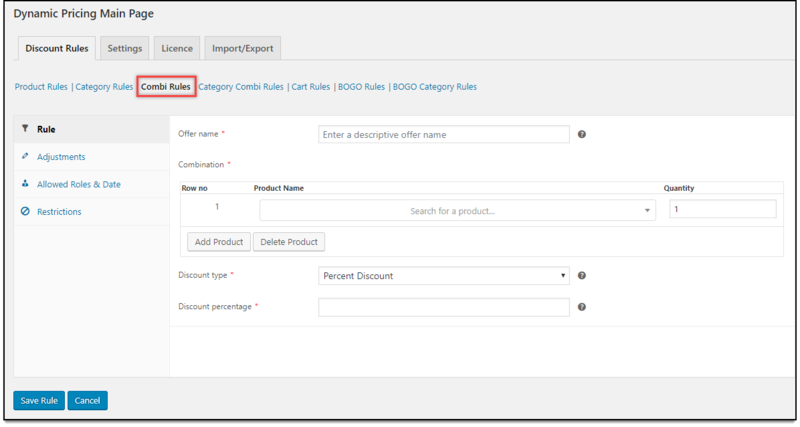 You can choose to import discount rules using either JSON or CSV file. The settings are as shown in below screenshot. Select the discount rule to be imported, and choose the required file to import. You can import only one type discount rule at a time. For importing JSON files, there are three conditions for importing. Overwrite the rules, if the rule number already exists. Skip rules, if the rule number already exists. Click this restore tab to delete all discount rules. This option will restore the plugin to its initial stage. If you wish to display all offers of your store in a single page on your website, you can use the short-code [eha_dynamic_pricing_offers_list_short_code] and paste it into your desired page. You could also create a separate page to display all the offers, as shown in the screenshot below. The Discounts and Offers page on your website will contain all the offers. The following screenshot shows all the discounts and offers we created earlier in this article. Screenshot of the page showing only one type of offer (Category Offers) is shown below.